Sarah Smith said her mother wanted her to be fearless. Fearless as a young gymnast who gave up normalcy for hour-long drives twice a day to practices that had her up well before the sun rose and back home after 10 p.m. Fearless as a teenager who struggled to find herself in high school after giving up gymnastics. Fearless as a Christian. “Fix your eyes on the Lord – be Sarah,” her mother would say. Who would have ever thought that Sarah would have to be fearless for her mother? Sarah was a young mother when she started to notice a tempering in her mother’s behavior; the once pristine emails she’d send were full of typos, and her “I’m a strong woman” mentality was clouded with incessant crying. Then it was her speech. In the beginning, Sarah’s mother, known as “Beauty” to her family and friends, tried to hide what was later diagnosed as early-onset Alzheimer’s from her children. 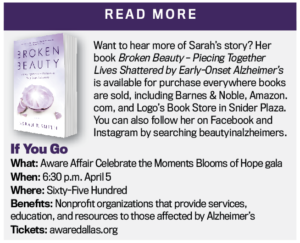 As Beauty continued to regress, Sarah put on the strong hat her mother used to wear and stepped in as caregiver – a decision that showed her exactly what Alzheimer’s looked like; her mom laughing after drinking nail polish remover or forgetting what a tortilla was. She was losing her mom and remembered asking God why he was letting it happen. When Sarah finally told God, “I need you to take this because I can’t do it anymore,” she experienced an outpouring of strength and love and fearlessness that’s showing itself in a growing ministry.